On a chilly Friday evening, I went out in search of something for dinner. I drove to a meat market that I hadn’t been to before, but whose website advertised a pretty wide variety of a few more unusual selections, such as goat and alligator. The store is in Aurora – and I’m never thrilled with any errand that takes me to Aurora by myself since almost every crime that I hear about on the news for the Denver area takes place in Aurora. Not to mention the local pedestrians there with a death wish who randomly amble across busy intersections no matter who has the right of way or how many cars are just feet away from hitting them. But I let my quest for something-different-for-dinner overcome my misgivings and went in search of meat. With the intention of buying a whole duck or a duck breast for that night, I ended up bringing home two rabbits with no real plan of how to cook them, although I thought it might involve braising since we were also planning to braise some artichokes. After thawing the rabbits and looking them over, I swallowed my hesitation at butchering what I kept picturing as the cute little bunnies that run around outside our condo (come to think of it, they seem to have a death wish too, as they're continually darting in front of my car at the last possible second), even though these ones were already dead. So then I Googled videos of “how to butcher a rabbit”, and began cutting. It wasn’t so bad, and I felt strangely primal. Really, it should be no different than butchering a chicken, but somehow, it was a little more distasteful. Anyway. I still remember the day my cat Oreo brought me a dead rabbit that she had caught and killed. She dropped it at my feet and began purring and rubbing against my legs. I, of course, burst into tears and told my mom what had happened, who informed me that Oreo meant it as a present for me and I shouldn't be mad at her. It took me a few years after that, though, to come to terms with the whole food chain business, as it hadn't yet occurred to me that the cut up hot dogs I loved in macaroni and cheese actually came from a living animal before they made it onto my plate. After the meat was all cut up, I lightly browned the pieces in olive oil then simmered it in our Dutch oven in a broth of chicken stock, white wine, herbs and a little lemon (to keep the artichokes from turning brown), and then made some rabbit gravy for our garlic mashed potatoes with some of the flavorful braising liquid. 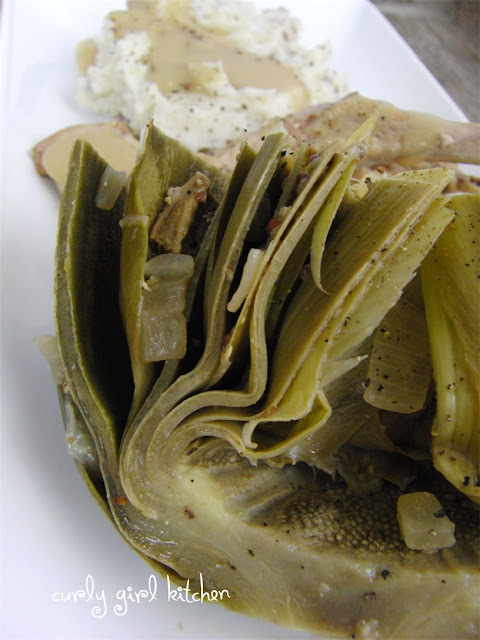 I enjoyed the braised artichokes, and we've cooked them just about every way you can - grilled, roasted, steamed, braised - but I have to say that sometimes the quickest and easiest method is the best, and for us, it's a simple method of steaming them in the microwave which continues to be my favorite time and again (method included below). It’s been years since I’ve tasted rabbit; the only time I can ever remember eating it before was in the Sichuan Province in China, and the dish was so spicy that I couldn’t even discern what meat I was tasting. So I was curious as to how this would taste, and Jamie and I found that it was very similar in flavor and texture to turkey. There really wasn’t much meat on the bones, and what was there was very lean with no connective tissue to break down, so next time, I might try battering and quickly frying them as I imagine that would go much easier than frying chicken (been there, done that, NEVER again). Those little rabbit pieces would probably fry up fairly quickly, though. After we finished, I picked the rest of the meat off the bones, chopped it up with some celery, mustard and mayo for a rabbit “turkey” sandwich spread. And if I didn’t know better, that’s what I would have thought I was eating! Clean the artichokes by cutting off the stem so they sit flat. Cut off the top 1/3 of the artichoke, then trim the pointed ends off the leaves. Spread the leaves out just a little. 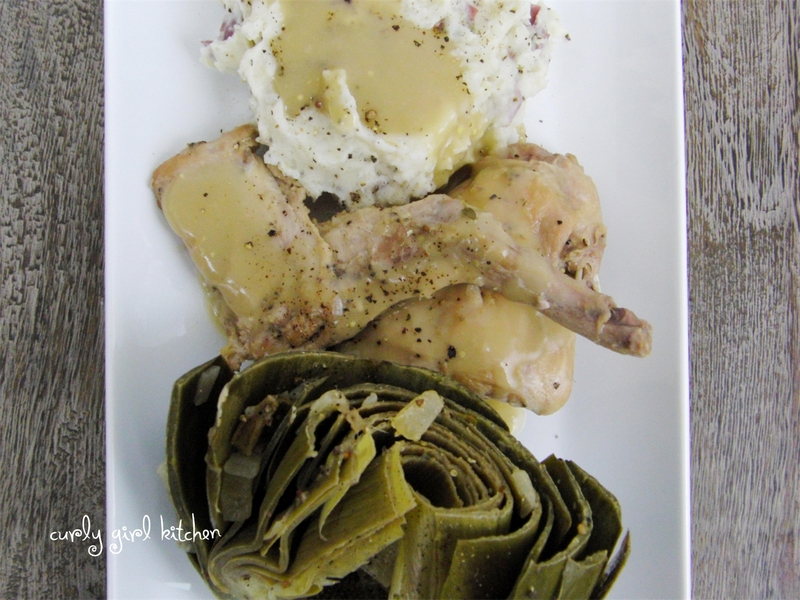 Place the artichokes in a microwave-safe glass bowl or dish. Drizzle each with a little olive oil (about a half tablespoon each) or place a small pat of butter on top. Sprinkle generously with garlic powder, salt and pepper. Pour a little water in the bottom of the dish, about a quarter inch. Microwave on high for 8 minutes. Let cool for a few minutes then serve warm with your favorite dip or aioli. Place a Dutch oven on the stove over medium heat. Heat the oil until it shimmers. Season the rabbit generously with salt and pepper, then dust lightly with flour. Working in batches, lightly sear the rabbit in the hot oil, about 2 minutes each side. Place the seared pieces on a plate and cover with foil. Add the onion, carrots and celery to the pan and cook for 7-10 minutes, until softened and beginning to brown around the edges. Add the white wine to the pot to deglaze the bottom and use a wooden spoon to scrape up any browned bits. Stir in the stock, garlic, mustard, herbs, lemon and butter. Nestle the rabbit pieces into the liquid. Cut the stems off each artichoke then cut each artichoke in half (vertically) and clean out the purple, prickly leaves and the fuzzy choke from the middle. Place cut side down on the rabbit pieces. Cover, bring to a boil, then reduce to medium low to simmer for about an hour, until the artichokes and rabbit are tender. 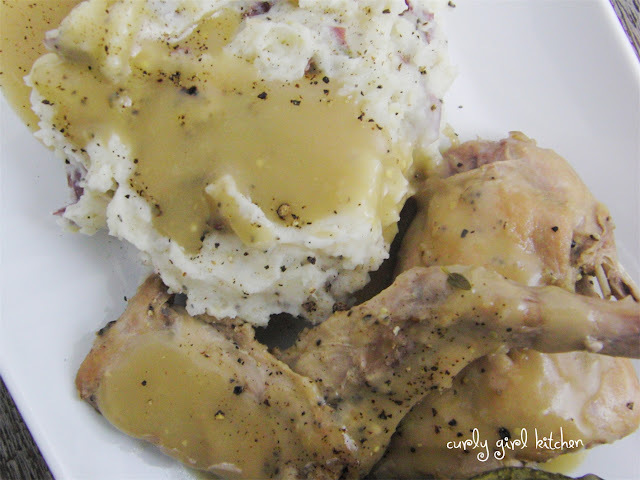 If making gravy, melt 3 tablespoons of unsalted butter in a skillet over medium heat. Sprinkle with 3 tablespoons of flour. Whisk the flour/butter mixture until smooth, and cook for 3 minutes. Ladle some of the hot broth from the dutch oven into the skillet, about a half cup at a time, whisking to smooth out the gravy. Continue whisking in hot broth until the gravy has reached the desired consistency. Reduce heat to low until ready to serve.